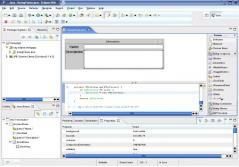 Eclipse SDK is a free software framework delivering an open-source Java IDE and platform, developed for creating rich client applications. Except from a small runtime kernel, Eclipse is based on plug-ins, thus providing a great variety of features and at the same time offering the possibility to extend its functionality by using other programming languages, such as C and Python. - Equinox OSGi, a standard framework. - A core platform, used to boot Eclipse and run plug-ins. -The portable Standard Widget Toolkit (SWT). - JFace, viewer classes delivering model view controller programming to SWT, file buffers, text handling and text editors. - The Eclipse Workbench, containing views, editors, perspectives and wizards. This is a handy set of drivers used for PDF generation.